An industry-leading kids program is about to get even better. Carnival Cruise Lines unveiled a new partner at a press conference Wednesday aboard the Carnival Splendor docked at Manhattan’s Cruise Terminal 711. 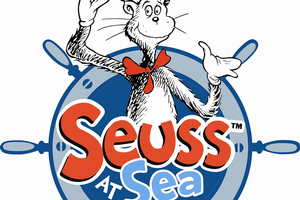 As a continuation of its Fun Ship 2.0 program to revitalize the fleet’s activities, Carnival has partnered with Dr. Seuss Enterprises to create Carnival’s Seuss at Sea program that will use both characters and atmospherics from within the poetic world of Theodor Seuss Geisel a.k.a. Dr. Seuss. The Seuss at Sea program will offer several immersive youth, family, dining, books, toys and showings of such movies as “The Cat in the Hat” and “How the Grinch Stole Christmas". 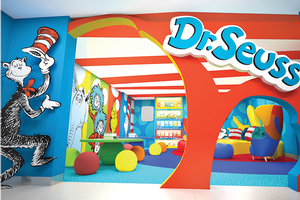 Under the partnership, all of Carnival’s 24-ship fleet will offer a series of Dr. Seuss themed activities and products. 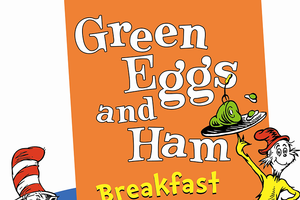 The Green Eggs and Ham breakfast in the main dining room, for instance, will feature foods right out of Dr. Seuss books and movies, including green eggs and ham, moose juice and goose juice, along with such playful concoctions as colorful fruit and pancake stacks, funky French toast and more, with traditional breakfast favorites also available. During the meal waiters and waitresses will wear Seuss-inspired uniforms, In the meantime such characters as Cat in the Hat, Thing One and Thing Two and Sam I Am will interact with guests at their tables. 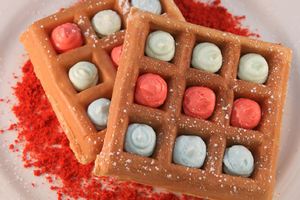 Hosted on the first sea day of each cruise, this special breakfast will be available for $5 per guest. The ships will also offer special Seuss themed cabins and such activities as the Seuss-a-palooza, a once-per-cruise character parade leading to a Dr. Seuss story time read by a professional narrator. 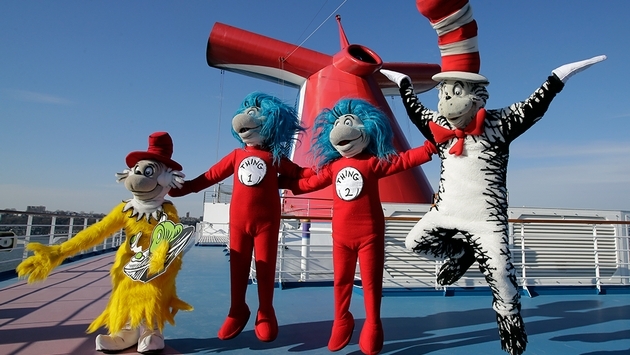 Roll-out of the Seuss at Sea program will begin aboard Carnival Splendor in February 2014 with implementation across the full fleet by 2015. 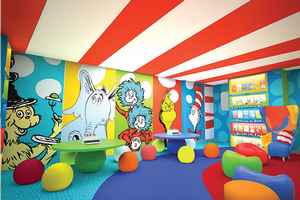 The Carnival Freedom, which is undergoing a major refurbishment in May, and Carnival Vista, which debuts in early 2016, will have Dr. Seuss Bookville facilities, which are Seuss-inspired play and reading rooms. Mock-ups of the room design are pictured below. Earlier this week, Carnival announced two more such experiences in their introduction of the American TABLE and the American FEAST. 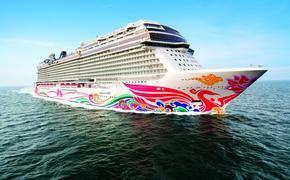 In this latest partnership Carnival reinforces core market strength, families. In 1993 Carnival became the first cruise line to offer on board youth camps. About 700,000 children sail annually with Carnival, which carries about 4.5 million total passengers per year. Today Carnival ships feature three tiers of kids programming Camp Carnival for ages two to 11; Circle C for kids 12 to 14; and Club O2 for kids 15 to 17. Carnival officials said the Seuss activities will be a supplement to the kids clubs, not a replacement. “Dr. Seuss inspires imaginations across generations and encourages a playfulness and whimsy that is often lost in today’s ‘always on’ society,” Brandt said. “We’re excited to be working with Carnival Cruise Lines to bring some of the timeless magic of Dr. Seuss to the families that sail each year." The Seuss At Sea program is only in its initial phase. Carnival plans to continue seeking new ways to integrate Dr. Seuss into new activities. The partnership reflects a “long term commitment” said Mark Tamis, senior vice president of guest operations for Carnival Cruise Lines.